The OMEGA™ CDH-SD1 is innovative and easy to operate. 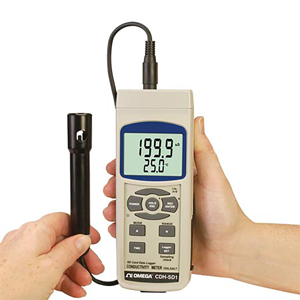 What sets the CDH-SD1 apart from other conductivity meters is that it incorporates a real-time SD card data logger. The CDH-SD1 measures conductivity, TDS (Total Dissolved Solids) or salt concentration using a carbon rod electrode for long life. Downloading data from the SD card into an Excel spreadsheet allows the user to do further data or graphical analysis without special software. The CDH-SD1 has a wide variety of applications from water conditioning, aquariums, beverage manufacturing and fish hatcheries to food processing, photography, paper and plating industries, educational and other laboratories. 참고: Comes complete with operator’s manual, probe, 2 GB SD card, hard carrying case and 6 “AAA” batteries.